Thank you to our supporters who donated last year and have made this work possible. Our daily "Chronicle AM" roundup took a week off for the holidays, but will return tomorrow. Welcome to our new contributor, Denver-based journalist Rebecca Chavez. 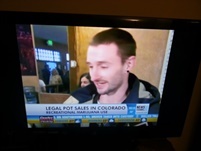 It has been a historic day in Denver, with the first legal retail sales of marijuana having taken place early this morning. It's a new era. Adult marijuana sales become legal tomorrow in Colorado, but would-be retailers are having to deal with some bumps in the road. Uruguayan President Mujica has signed that country's groundbreaking marijuana legalization bill into law. The government now has 120 days to craft rules, and then Uruguay's era of legal marijuana commerce will commence. Florida's law mandating the suspicionless drug testing of welfare applicants has been found unconstitutional by a federal district judge. Gov. Rick Scott (R) says he will appeal. The dispensary and cultivation wars continue in California, dispensaries are delayed in Nevada, a bill moves in New Jersey, and more. The Alaska marijuana legalization initiative signature-gathering campaign has gathered nearly 45,000 signatures. They only need 31,000 to make the ballot, but they need a healthy cushion to account for ones that get invalidated. San Francisco's district attorney and San Diego's police chief have filed an initiative that would defelonize most drug possession and other nonviolent crimes. But will they try to get it on the ballot in 2014? Ed Rosenthal joins an increasingly crowded field of California marijuana legalization initiative filers. The question is: Will any of them be on the California ballot in November 2014? A Texas deputy has been shot and killed in a dawn no-knock drug raid over a few marijuana plants. A San Diego man detained by the Border Patrol after being caught carrying three pounds of marijuana died in a holding cell Christmas Eve. An Ohio woman sitting on the couch of a mobile home about to be hit in a drug raid is dead after a deputy standing outside the house accidentally discharged his weapon, striking her in the head. A probation officer gets caught growing marijuana, a task force commander is accused of stealing $90,000, more cops get nailed for spilling the beans to drug suspects, and more. A pair of state appeals courts slap down cops who take people's medicine and won't give it back, there are problems with Kansas' drug testing law, Peru is buying shining new toys to prosecute its drug war, and more. The marijuana court judge was drunk, Dread Pirate Roberts wants his bitcoins back, Beto O'Rourke wants the Border Patrol to answer some questions, Rand Paul and Cory Booker tweet policy, and more. The first business licenses for legal marijuana shops have been issued in Colorado, dispensaries are delayed in Nevada, hemp is on the agenda in Kentucky, and Uruguay's legalization example is causing reflection in the region. And more.